We are very proud to announce that, this season, for the first time in the Club's, history we will be running a Ladies Football Team. The team has already been registered with the Herts FA and we are currently recruiting players. 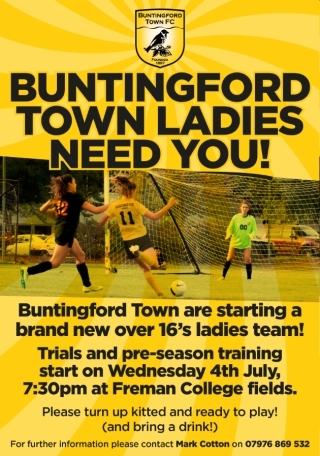 If you are interested in joining Buntingford's only Charter-Standard Adult Club, please get in touch either via this website, Twitter or Facebook. Otherwise, just turn up for our first pre-season training session, at Freman College, on 4th July.